Those of you who are faithfully checking in on me know that this post wasn’t published on Friday. It’s really Saturday. I cannot post a “Fitness Friday” when in reality it is Saturday. Therefore, I have sub-titled this post “Slim Down Saturday” in order to keep things honest and real. We are busily preparing for our vacation, but I’m taking a few moments to post. I’ll be gone about two weeks! I’ll be having “blogging withdrawals” by the time I get back! However, I should have TONS of new photos to post, [I just finished emptying my memory card on my camera to make room!! ]and lots will be happening, so when I do get back to my spot in cyberspace it should be interesting. For my Fitness Friday, um, (clears throat) I mean Slim Down Saturday, I wanted to post about our feet! After all, our feet are the foundation of our bodies! If you’ve ever stood in Super church on tile floors for an hour or more wearing two inch heels, then you know how important your feet are. If you have ever broken your little toe on a ceramic toilet in the dark, then you, my crippled friend, really know what our feet mean to us! Yes, I’ve lived through both experiences. Feet are important. They are everything!! Think of it like this: Sore feet = Sore attitude. Well, that’s true for me anyway. I recently purchased brand new tennis shoes. Or sneakers. Whatever you call athletic shoes, I bought some recently. I couldn’t believe how pitiful my old shoes looked. I had bought them back when Clinton was in office. Yes, it was definitely time to get new ones. I bought them in the spring of 2000. Eight years ago. My goodness. And, amazingly, they really don’t look as bad as you would think eight year old tennis shoes/sneakers would look. They had seen me through many a Denise Austin workout, and many a long walk. They are good friends. In fact, they would make a good commercial for Nike. But, all sentimentality aside, I had to retire them. 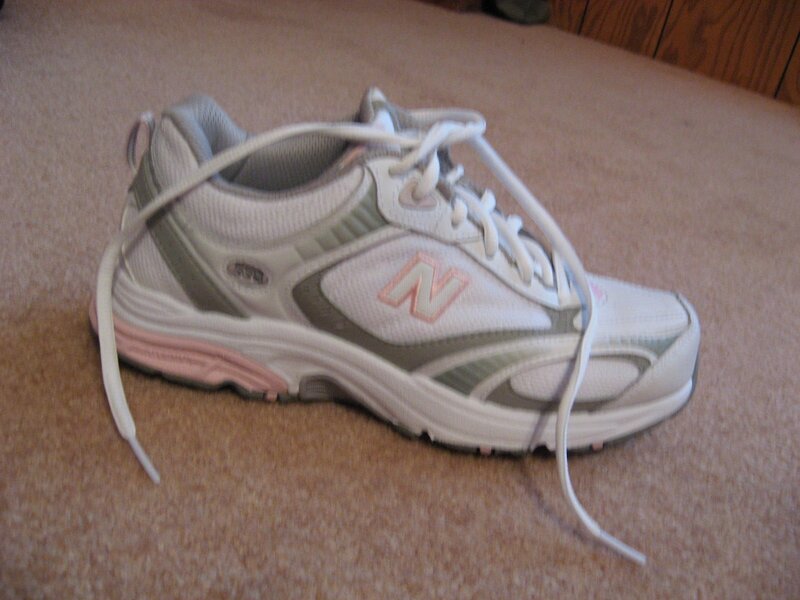 This time, I bought New Balance.They are a half-size larger than my last pair. I have used them for about a month, and I am a very satisfied customer. NIKES, circa 2000 model. You were a good shoe. After I bought my new shoes, I was telling my Mom about how much better my feet felt while exercising. She told me that she purchases a new pair every year. She’s read that every 500 miles you should buy new tennis shoes/sneakers. She walks two miles a day, so the “once a year pair” is just right for her. Mine were a little over that, but hey, better late than never. I hadn’t realized how uncomfortable my old shoes were making my exercise until I used new ones! The difference was amazing! 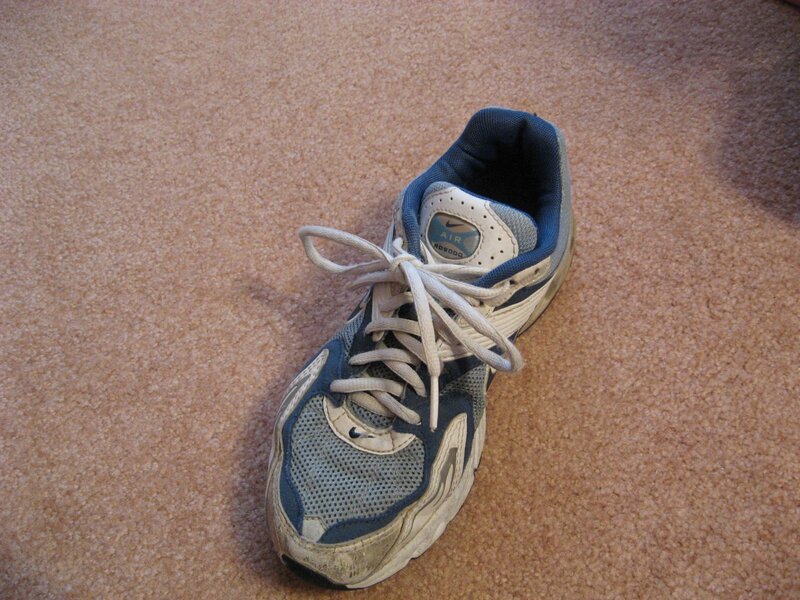 Unless you’re a swimmer or skier, then your shoes can make or break your workouts. And walking is a workout! Be sure your footware is foot friendly. Buy a new pair every year. Feet are so important that legendary basketball coach, John Wooden ,(formerly of the UCLA Bruins) taught his players how to properly put on their socks before he taught them a single play. After all, what good is dribbling and shooting, if your feet hurt so badly you can’t even walk? Remember, if you take care of your feet, your feet will take care of you! Here’s this week’s funny! Have a great week!! I love the cartoon, and how in the world did you know that bit of trivia about John Wooden? Very interesting. Have fun in North Carolina and all along the way. Be sure to take plenty of rest stops to break in those pretty new shoes.